20-year-old Tasmanian George Vaughan had three main goals for his trip to the United States last month: see a Metallica concert, visit Niagara Falls, and go to a landfill in the US state of Alabama. The landfill, he hoped, would help him realise a dream he’d held for six years: to see a laughing gull, a “seagull” generally considered a nuisance by your average American beachgoer. The young Australian’s posts described the most ignored birds of North America in well-written, excited prose, celebrating the “evocative” sounds of the Canada goose, the “pleasing shape” of the mockingbird, and the beauty of turkey vultures, which Vaughan lauded as “more graceful aéronauts” than hawks. I’ll note that even some seasoned American birders avoid the gulls—they all look pretty similar, and each one can go through several different plumage patterns before maturing. They’re really hard to properly identify—there are entire books devoted to telling them apart. But Vaughan noticed things I never did, and I was hooked on his lists. 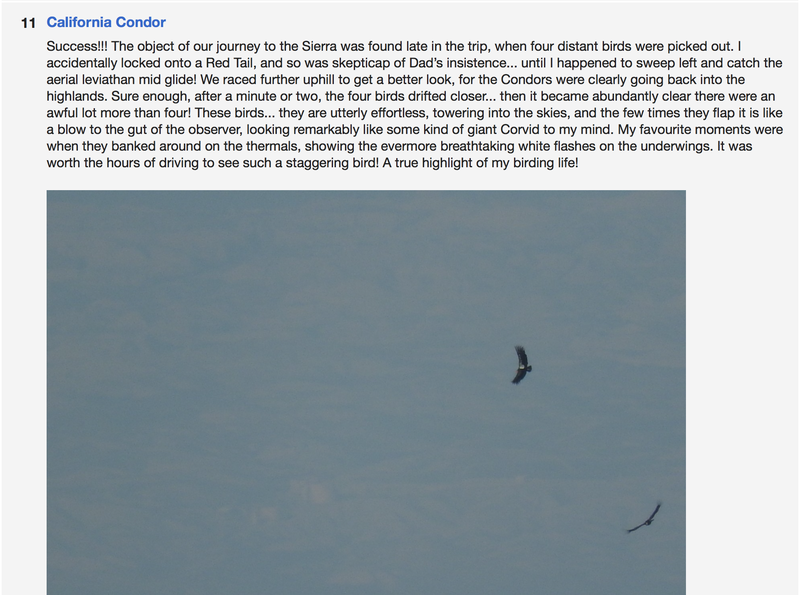 I followed along on his vacation through eBird, wondering what he’d see next. His enthusiasm for birds I see every day became a regular treat—it captured a joy I remember experiencing at my first car show as a car-loving kid, or the first time I saw a flock of a favourite bird of mine on a family holiday. I found myself wanting to know more about the man behind these lists. I reached out to Vaughan, and he agreed to answer a few questions about his visit to America and his love for gulls on Skype. A young-looking university student with tousled hair and glasses, Vaughan says he’s studying ancient Greek history and language as well as, unsurprisingly, creative writing. He says writes short- and long-form fiction for fun, and does not use social media. Vaughan attributes his early interest in ornithology and wildlife up to watching David Attenborough. He says he saw 13 new species of gull while visiting the US. What was it like when you first landed in the United States? George Vaughan: It was remarkable. We were only there for the tiniest bit of time for the transition from LA to New York. I was thinking it would be too early to get any of the gulls, and I’m sitting there on the planet looking out, and this big gull comes across with really steady wing beats compared to what the Australian gulls have. It banks, and I think, ah yes, that’s a herring gull. There’s a real romance to the herring gull, because it’s a species that we should have had in Australia a hundred times over but it’s never gotten here. Another gull with stiffer wingbeats comes over, I think, that’s going to be a western gull, and it was. I thought, oh my gosh. Funnily enough, once we got to New York it took a bit of a while to find any gulls because we were staying right next to Grand Central Station and a skyscraper would skewer any sort of flyover. We walked down to the park by the United Nations building and looked out onto the Hudson where there was a big ball of ring-billed and great black-backed gulls with some herring gulls. It was truly remarkable to see a great black-backed gull [Ed note: the great black-backed gull is the largest gull in the world with a wingspan larger than a red-tailed hawk’s. They are a relatively common sight in New York]. One of my earliest David Attenborough memories was of a great black-backed gull chomping down on whole puffins. They didn’t actually look that large, despite the fact that they really are massive creatures. When did you start liking gulls, and why do you like them? Vaughan: You can trace it back to a specific moment. In 2013 I was looking through the main Australian bird books by Pizzey and Knight. In Australia we have only three species of gull—the ordinary-looking silver gull, the large-billed Pacific Gull, and the Kelp gull which you get over in America sometime. But looking at the laughing gull, this absolutely beautiful bird with the black hood and white eye ring—there’s nothing like that in Australia. All of our gulls are white-headed. The colour combination really resonated with me. From there on I became addicted to gulls. I like them so much partially because they’re a real challenge. My other key passion in birding is the shorebirds. [Ed note: these are another group of birds famous for being hard to tell apart.] There’s something about these kinds of birds where they tend to get overlooked a bit. You have to check every single one of them. It really keeps you occupied. On top of that, I love the colour scheme of gulls. There’s just something about that very basic black, white, and grey. It’s done with just the right proportion of colour. 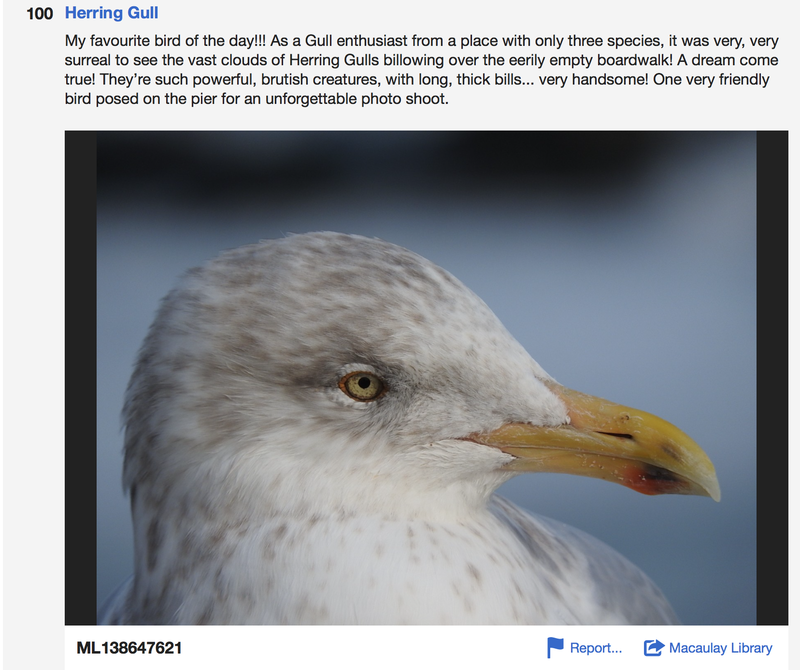 How do your friends or family members feel about your gull obsession? Vaughan: They treat it with the sort of balance between intrigue, respect, and flat out worry that it deserves. And it’s not all gulls, right? 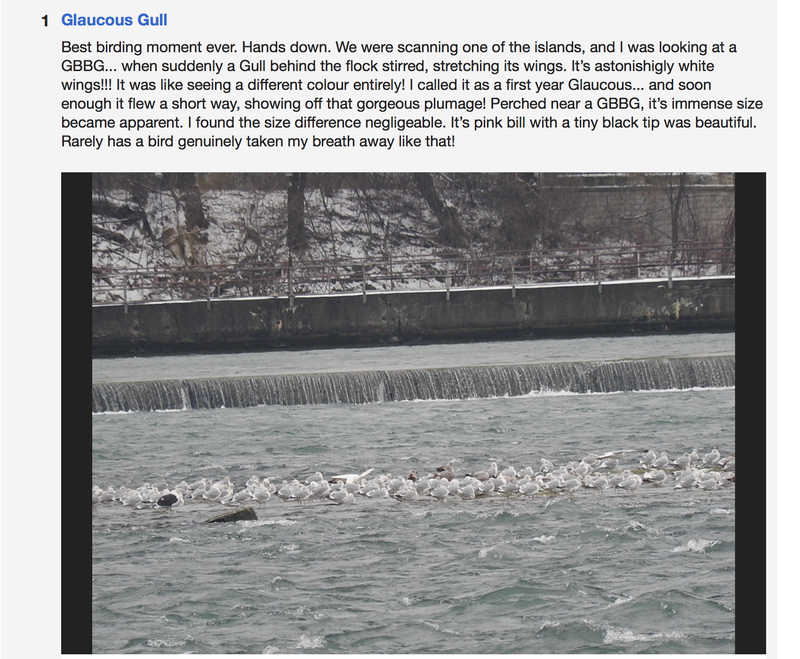 As much as I am a gull fan you are right—I do really enjoy all of the birds. There’s a real romance for me of the regularly occurring of the American species. One of the most remarkable ones for me was seeing my first turkey vulture which I never realised quite how nice to look at they are. They’re such an effortless creature, it’s remarkable. I was stunned because we were in the absolute middle of Nashville walking along, we’d just been in Jack White’s recording facility, and I look up at the sky and you just instantly know it’s a vulture. It was really quite rewarding. Why do you put so much time and effort into your eBird lists? They’re really well-written, and me and some of my birding friends could really feel your excitement through them. It’s great that that’s how it came across. One of the things I really hoped was that [readers] would be able to feel like they were there with me, having their faces buffeted with snow at Niagara Falls. Also one of the things for me is trying to encapsulate the bird very specifically. One of my biggest inspirations in bird writing and reading about birds is of course John James Audubon. [Ed note: Audubon is perhaps the most famous ornithologist and namesake of the National Audubon Society who illustrated The Birds of America. You can find his paintings and writings here.] He absolutely encapsulated the essence of each bird that he wrote about in a way that was science and art. I really wanted to channel the same combination of science and art to really get the enthusiasm across and hopefully get more people enthused in it. Many Americans would probably call gulls “garbage birds,” given how common they are. What would you say to that? Vaughan: I would say it’s all very well to discount them and just over look them, but really just take that little bit of closer look and a little more time. It’s really very therapeutic in a way to just be able to take something that’s absolutely everywhere and spend a little time looking at it, really absorbing the individual characteristics of that particular bird. You can get a huge amount of enjoyment doing that. People who discount gulls miss out on that, I think. It might seem like Vaughan is an expert with some niche interests, but he’s not: He’s just a 20-year-old who pays attention to the natural world. When I went back to look at some of his lists from Tasmania, sure, he sometimes left the flair out, but his entries were often just as thoughtful or specific when describing local birds. Reading his lists changed me a little bit—this past weekend, I found myself watching a group of common gulls foraging and lounging around a pier, when a suddenly a rarer gull species I’d never seen before swooped overhead. I never would have noticed it if not for Vaughan’s lists. But, in the end, Vaughan’s keen eye for gulls left less of an impression on me than his earnest adoration of the birds. Amid the endless barrage of viciousness and cynicism you often find online these days, it felt really good to read someone who didn’t concern himself with all that stuff. Vaughan just likes gulls, and he likes them a lot. You’re allowed to like things, even weird, common things.